These are the last of the tags that I made for my mom, sisters, and sisters-in-law this year. To quickly add a few to the stash, I used some print and cut tags that I found in the Silhouette Store. I sized them at 2" wide and made an external offset, which I cut in red and green cardstock, along with the little circles. On the back of each tag, I used the My Creative Time Just Tags stamps to stamp "to" and "from." Then I added some thick hemp from Liz's Paper Loft Boutique. The original file allows for cutting all of the different parts of the tags, but by just printing, it only took about an hour to put together 15 of them! 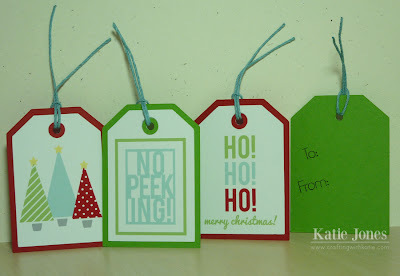 Super quick and easy tags are the way to go at the last minute.